Roosevelt challenges a long-time Democratic campaigner to consider whether his preference for Republican Herbert Hoover is due to a prejudice against Alfred E. Smith’s Catholicism. FRANKLIN D. ROOSEVELT. 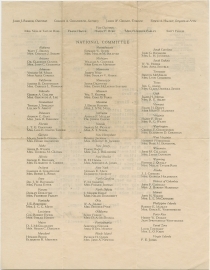 Typed Letter Signed, to William H. Higgs, on “Democratic National Committee” stationery, New York, September 1, 1928. 1 p.
Naturally your letter of August 30th is a great disappointment to me and I hope that you will reconsider your decision to vote the Republican ticket especially after all the years you have given to help make the Democratic party amount to something. I know you will not mind my asking you frankly whether you are not a good deal influenced by the fact that Governor Smith is a Catholic. It is an interesting fact that about 95% of the opposition to him in Democratic circles is due to the religious issue and not in the final analysis to prohibition or any other political issue before the American public. If you knew both the candidates personally as I do, I am very certain that it would eliminate any prejudice that you may have in your mind and make you conclude that Governor Smith would make the better president of the two. Just before the 1920 election, in which Franklin D. Roosevelt was the Democratic nominee for Vice President, William H. Higgs wrote to Roosevelt that the Democratic Party needed an upstate “header,” and that “you were the man to take Hold and Put us in Fighting trim.” After the election, Higgs was convinced that “We Never can win until you or some other Strong man takes Hold.” Higgs suggested an upstate Democratic Club to work with the “Regulars.” In 1925, Higgs urged Roosevelt to run for governor against incumbent Governor Alfred E. Smith. Roosevelt optimistically responded, in part, “You and I will live to see the day when upstate is more democratic.” Although Roosevelt made some advances, the area remained solidly Republican: Wayne County gave a majority to a Democratic presidential candidate only once in the twentieth century, to Lyndon B. Johnson in 1964. 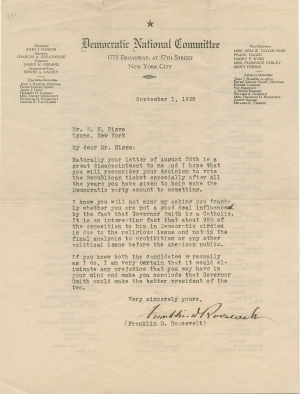 After more than a decade of correspondence, Roosevelt was now shocked to learn that Higgs planned to vote for Republican Herbert Hoover rather than Democrat Alfred E. Smith. Herbert Hoover won the 1928 presidential election by a commanding 58 percent of the popular vote to succeed President Calvin Coolidge, who did not seek reelection. Hoover received more votes than any presidential candidate before him, carrying forty states in the Electoral College, including Al Smith’s New York. Hoover won 75 percent of the vote in Higgs’ Wayne County. Anti-Catholicism depleted Catholic Smith’s ranks, as did his opposition to prohibition and association with the corruption of Tammany Hall. Roosevelt narrowly won the New York gubernatorial race with a plurality of 26,000 votes out of more than 4.3 million cast. But the public’s unhappiness with the eighteenth amendment and Hoover’s inability to combat the Great Depression resulted in his loss of the 1932 election to Franklin D. Roosevelt, in an almost inverse result of the 1928 election. William H. Higgs (1863-1939) was born in Michigan. By 1920, he was a commercial grocery purchaser who lived in Lyons, New York. He married Carrie E. Armstrong in 1889, and they had three sons. She was a practical nurse and died in June 1926. In 1930, he was a retired widower, living with his son and daughter-in-law in Lyons. Alfred E. Smith (1873-1944) was born in New York City of Irish, Italian, and German immigrant ancestors. Dropping out of school at age 14 to support his family after his father’s death, Smith worked at a fish market for seven years. Although supported by Tammany Hall, Smith remained untarnished by charges of corruption while serving in the New York State Assembly from 1904 to 1915. He served four terms as NY governor, from 1919 to 1920 and 1923 to 1928. He unsuccessfully sought the Democratic nomination for president in 1924, and won the nomination in 1928. The nation’s general prosperity and Smith’s Catholic faith led to a landslide for Herbert Hoover. Smith felt slighted when Roosevelt was governor of New York (1929-1932). He sought the Democratic nomination for president again in 1932, but lost to Roosevelt, and was critical of many of Roosevelt’s New Deal policies as president. William H. Higgs to Franklin D. Roosevelt, January 1, 1921, General Correspondence, 1920-1928, Box 2, Folder 11, Franklin D. Roosevelt Presidential Library, Hyde Park, NY. William H. Higgs to Franklin D. Roosevelt, June 28, 1925, Franklin D. Roosevelt to William H. Higgs, July 7, 1925, General Correspondence, 1920-1928. William H. Higgs to Franklin D. Roosevelt, January 11, 1927; Roosevelt to Higgs, January 13, 1927, General Correspondence, 1920-1928. Higgs to Roosevelt, April 18, 1928; Roosevelt to Frederick Stuart Greene, April 23, 1928; Greene to Roosevelt, May 4, 1928; General Correspondence, 1920-1928.